KIRO 7Starbucks workers say that finding needles in bathrooms has become an almost daily routine. 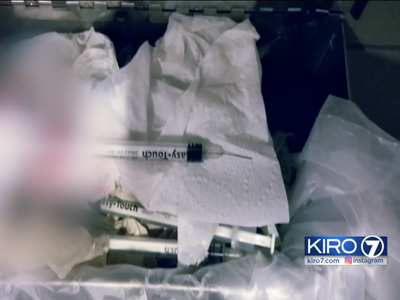 Starbucks workers in Seattle say that they encounter hypodermic needles nearly every day at the chain and that the problem has grown worse under the chain’s new open-bathroom policy. Several Starbucks workers in Seattle say that they’re encountering hypodermic needles on the job nearly every day and that they have had to take antiviral medications to protect themselves from HIV and hepatitis. According to the baristas, the problem has gotten worse since Starbucks earlier this year changed its policy to open its bathrooms to everyone, including people who aren’t making any purchases. “Because you don’t have to bother with purchasing anything, needles have definitely increased,” one employee told KIRO 7. 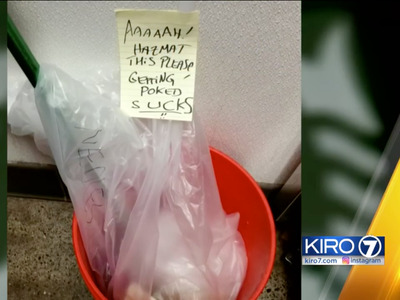 KIRO 7Starbucks workers provided KIRO 7 photos of the cleanup and lists showing how often needles were found. “The drug abuse crisis in Seattle impacts every company and we urge city officials to work with employers to make our public places safe for everyone,” Borges said. Chains across the US are grappling with how to deal with the impact of the opioid epidemic. New York University’s Center for Drug Use and HIV Research found last year that almost 60% of managers had come in contact with drug use in their businesses’ public bathrooms, City Lab reported last month. Borges said that while Starbucks does not force customers who haven’t paid to leave stores, the company has some expectations for visitors; drug use, drinking, and disruptive behaviour are still banned at stores. “We expect our customers to behave in a certain way,” Borges said. If you’re a Starbucks worker, we want to hear your thoughts on the open-bathroom policy. Email ktaylo[email protected] to share your perspective.